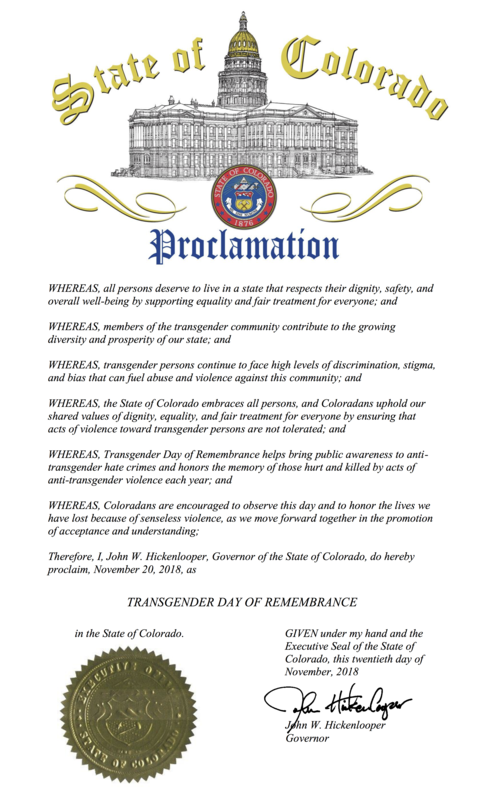 Today, Colorado Governor John Hickenlooper issued a proclamation in honor of Transgender Day of Remembrance that called on all Coloradans to observe this day and to honor the lives we have lost because of senseless violence as we move forward together in the promotion of acceptance and understanding. The language of the proclamation can be found below as well as the paper version of the proclamation. 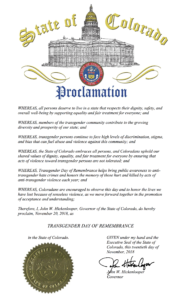 Therefore, I, John W. Hickenlooper, Governor of the State of Colorado, do hereby proclaim, November 20, 2018, as Transgender Day of Remembrance in the State of Colorado.